Now this is how you do teenage vampire angst. This is one of the strangest movies I've ever seen, and I mean that in the very best possible way. Although I've seen most of George Romero's filmography (including one during last year's Project Horror), I'd never even heard of this movie before I started looking for films to fill my month with. Although I think really highly of Romero's zombie movies, his other stuff can be hit or miss, so I went into this one with tempered expectations. It turns out that this was a really great movie! Now, don't get me wrong, it's still very much a B-movie. Its strength isn't in its special effects, editing, or acting. In fact, Romero stretched his budget as far as he could by casting his friends and relatives (and even himself) in several roles, and it's obvious that they aren't pros. In reading about this movie, I learned that one of the main characters had his last name changed from what was written in the script because the exterior of the store that was used for the character's business was painted with a different name. This thing was shot on a shoestring budget, and it shows. So, what makes it so enjoyable? I'll get to that in a minute, first I've got to tell you about the plot. Martin is a boy in his early 20's who arrives in a run-down industrial town to live with his granduncle, Tada Cuda. Old World traditions and superstitions shape Cuda's life, and he is Martin's closest living relative. While Martin is on the overnight train to town, we see him stalk, sedate, and kill a fellow passenger, and then drink her blood, something that he also does to other women throughout the movie. He experiences flashbacks of himself as a gothic romantic vampire, pursuing women through castle corridors and being pursued by angry mobs. His uncle makes it clear that he first intends to save Martin's soul, and then to destroy him, something that Martin mocks him for, telling him that there's no real magic. Cuda warns him, though, that if he hears of Martin killing anybody in town, he will instantly destroy him, unsaved. Although he is painfully shy, Martin tries to reach out to different people. He forms a friendship with his cousin, who also lives with Cuda, and who also yearns for more freedom. He calls a late-night radio talk show to tell the host about his life as a vampire. He tentatively starts a relationship with one of Cuda's customers. It's that last relationship that ends up leading Martin to his ultimate fate. If you know me, you know that I really love the show Dexter. I love it so much that I watched this movie in the middle of the day while my kids were napping, just because Dexter is premiering tonight. Although Martin is very different from Dexter, I found myself enjoying it for one of the same reasons - it makes you root for the bad guy. There's no doubt that Martin is killing people for their blood, just like there's no doubt that Dexter kills bad guys who have fallen between the cracks. It shows you this right at the start of the show. But he's such a sympathetic character that you still want him to prevail against his uncle, just like you want Dexter to keep beating the law. Martin is a proto-Dexter. I also really liked the ambiguity about Martin's background. He experiences those flashbacks to earlier times, but you never know for sure whether these are things that actually happened, or are just part of Martin's fantasy. There's talk about dark family curses and secrets, but you never find out if there's anything to them, or if they're just the ramblings of a man who is still beholden to Old World beliefs. The movie leaves it up to you to decide just how real any of this is. This isn't the scariest horror movie, but it's definitely one of the most original. I give it five garlic cloves out of five. We saw this one a while back. 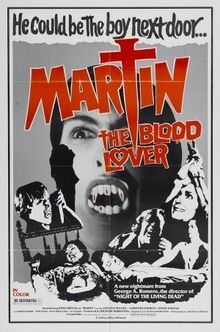 It was definitely good and an interesting take on the vampire film.